It's tempting to look back and think of Nintendo and Sega as long-standing rivals, and that was certainly the case during 8-bit and 16-bit era until the shock announcement that Mario & Sonic at the Olympic Games was coming to the Wii. 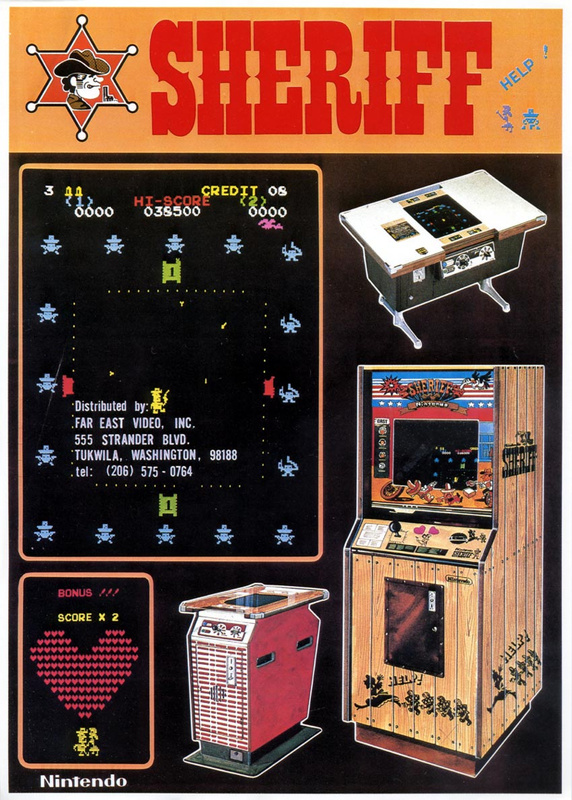 However, this wasn't the first time the two companies had worked together - back in 1979 Nintendo and Sega collaborated on an arcade cabinet. We recently paid a visit to collector London-based Alex Crowley to check out his fantastic Nintendo Arcade. 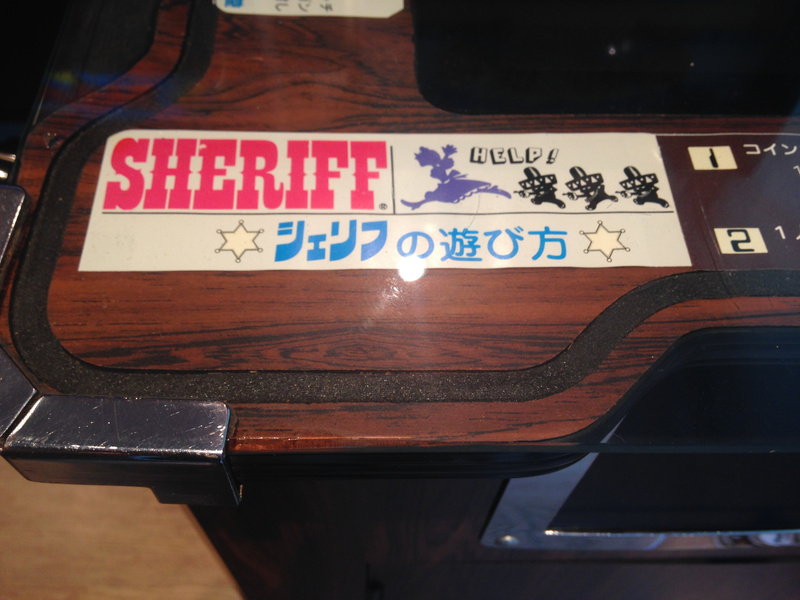 It was great to see his Popeye and Donkey Kong cabinets, but what really stood out to us what his Sheriff cocktail cabinet. 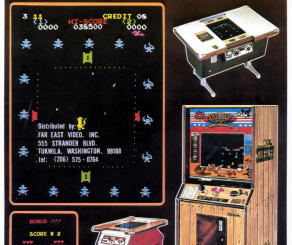 Nintendo's early arcade history was a bit chequered, starting out with projector-based games such as Laser Clay Shooting System and Wild Gunman before entering the more competitive video game arena with games which were basically clones of Space Invaders or Pong. 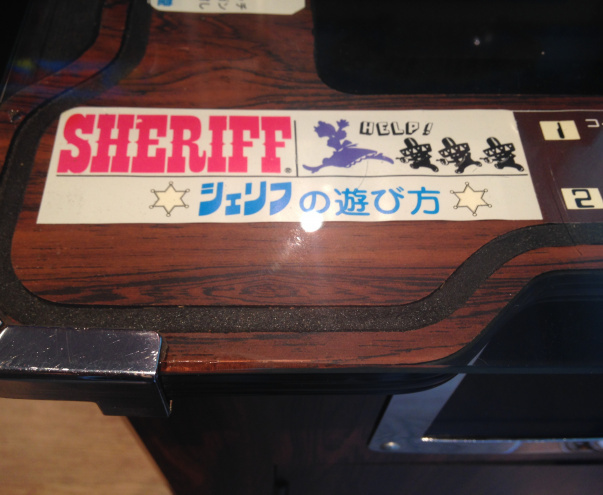 Sheriff was in fact the first original video game made by Nintendo, designed by Genyo Takeda with art by none other than Shigeru Miyamoto. The cocktail version of this Sheriff cabinet is unique as it is the only one known in existence. 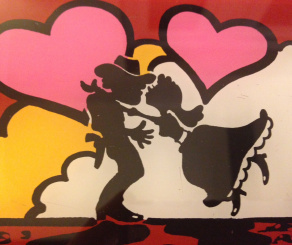 Manufactured in 1979, It was made for Japanese and European audiences and it was distributed by Sega in the UK. In America the game was renamed Bandio and distributed unofficially. The player takes control of a Sheriff named Jack (recently better known as a Smash Bros. Assist Trophy). In the game you have to protect the town from an onslaught of invading bandits - the gameplay is kind of like Space Invaders In this respect. Every now and then a condor will fly across the screen which you can shoot for additional bonus points. The game features a very unique control system, making it feel like an early twin stick shooter. 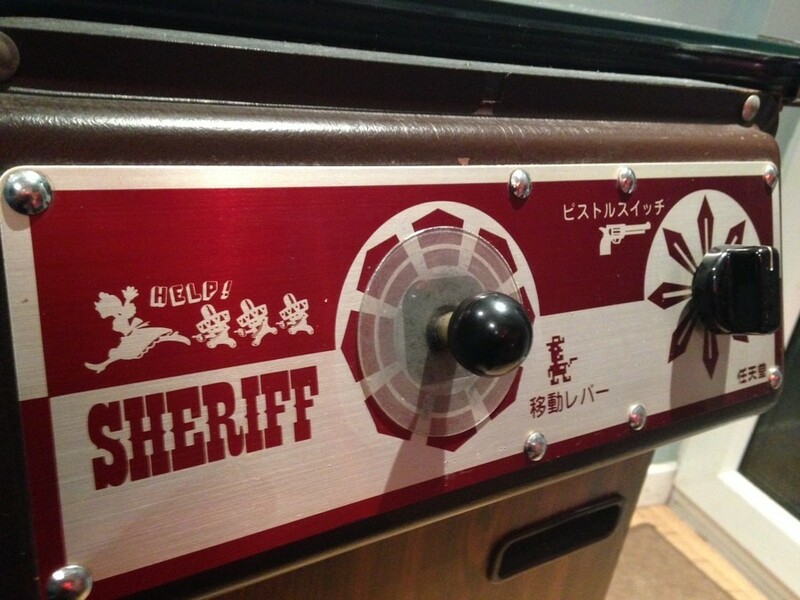 The left stick moves the sheriff character around the playing field, while the controller on the right-hand side looks more like a gas knob from a cooker than a traditional joystick. This offers 8-way multi-directional firing so you can get a precise shot on the invading bandits. Simply twist the gas knob around and push it in to fire - sort of like pressing in to ignite a stove! The control panel on Crowley's unique cabinet looks mint and the unit is in amazing condition for its age. 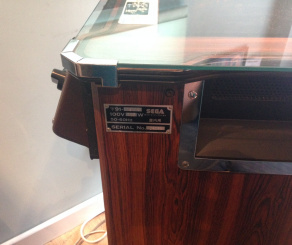 Even though its got a built in ashtray which authentically had some cigarette stubs left in it when collected, it is not thought that it was ever actually used in an arcade environment, as it only has 6000 plays on its counter. 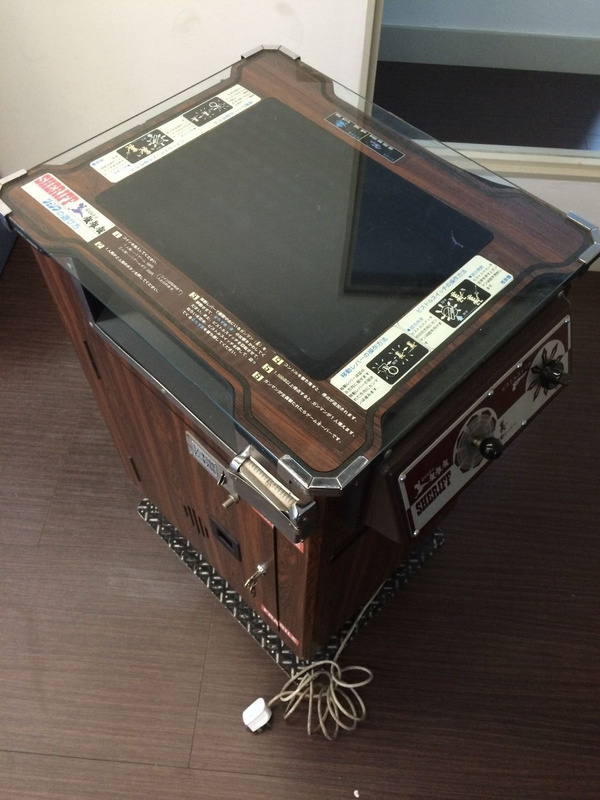 It's possible this particular machine was used at a trade fair to promote the game due to its immaculate condition and very few game plays. Inside the cabinet there's an original Nintendo logic board and soundboard just like the upright cabinet version of Sheriff, but it looks like it has been modified for this particular monitor - which has "NS" and "Sega Enterprise" written on it. On all the other cocktails cabinets that Crowley owns, it seems that Nintendo used Sanyo monitors. 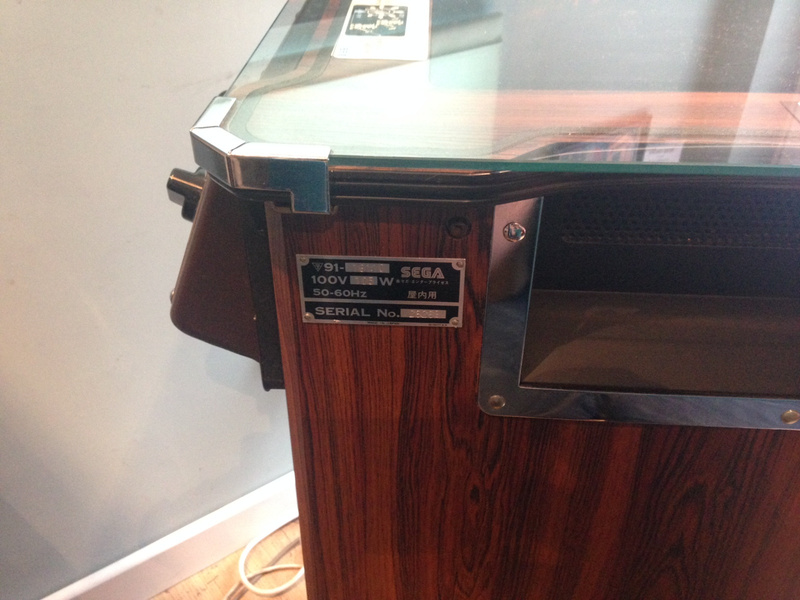 This cocktail cabinet is much more in keeping with Sega's technology of the time and was already used with Sega games such as Head On and Carnival. Sega simply let Nintendo put its own control panel on its cabinet and and then handled the distribution duties on Nintendo's behalf. Sega and Nintendo went onto to become the biggest rivals in video game history, kicking off what is still known as the greatest console war in gaming history. 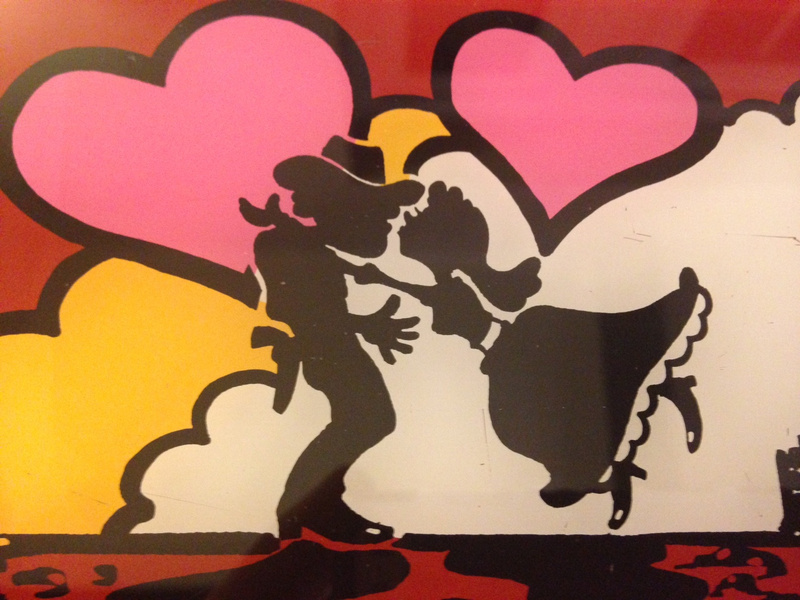 But they left a legacy here in 1979 when they worked together on this Sheriff cocktail cabinet. Check out the video below where Nintendo Life's Alex talks to arcade collector Crowley to find out more about his Nintendo arcade collection, and the ridiculously rare Sheriff cocktail cabinet. And I thought that that character of a Sheriff came from a game of "Color TV-Game", well, something new will get to learn each day. Looks similar to a game I remember seeing at Knott's Berry Farm back then in the late 70's. At the time they had an arcade that rivaled Disneyland's split level Tomorrowland arcade. But at that time most games were still in black and white. I love that Sakurai included the sheriff in the latest Smash, really shows the attention he pays to Nintendo's history. @DinoFett I've always wondered what people thought of gaming in the 70s before Mario and Pac-Man existed. @NintyMan: Yeah, that's the only version that's commercially available right now. I actually bought the VC release of WarioWare despite already having the cartridge just so I could get an arcade tabletop experience. It's definitely a stand-out among Nintendo's other games at the time, (which were mostly clones), and I recommend it. This article doesn't stand out from the other Sheriff ones. These guys talk about Sherrif atleast once a month. I don't see why its important now. Why not talk about how some Famicom games were made by SEGA? But no, I guess the arcade is much more important and newsworthy. A lot of grouchy Folks and negative Nancys in the thread. I used to love playing this game on the first wario ware for gba! 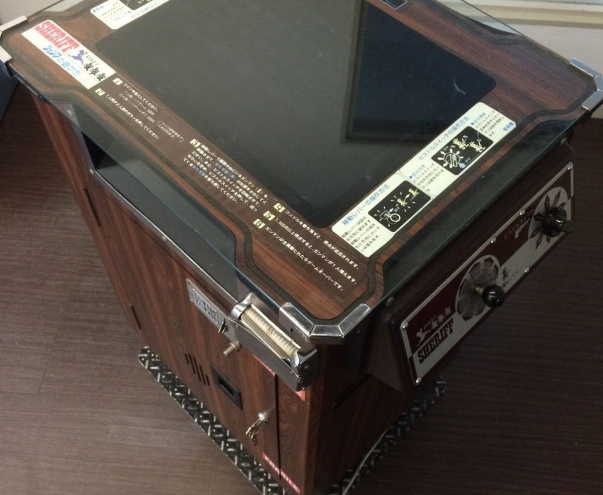 Id love to see some sort of compilation virtually recreating games like this cabinet ,the color TV games and those old electro-mechanical games would be a fun eshop title I think. i was wondering where that character from smash u came from, now i know! I love it when Nintendo ads history like that into their games Hopefully Nintendo and Sega keep teaming up even more in the future. Seeing the "Sheriff" character in my Subscription box by you guys really cleared up the character in Super Smash Bros. I can't believe that they put something that "out-there" in the game. Is it just me or having western settings and art with japanese text near it odd looking? It like a Spongebob with a japanese dub. This game is awesome, greatly indicative of the foundations of innovation and creativity that Nintendo is known for. Thanks again for the cool footage and interesting trivia, NintendoLife! It makes this game even more legendary. 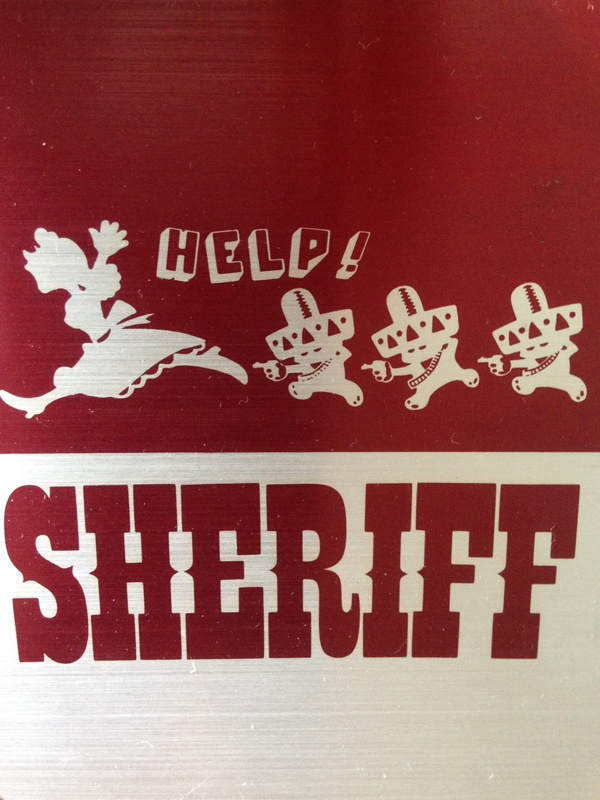 However, was Sheriff only released in the US unofficially (as Bandido), or was only a specific cabinet (or edition?) not officially released in the US? @Ayronom No Famicom games were made by Sega. Games were ported by other devs, but not by Sega itself. Interesting info. It reminds me of how SNK distributed Capcom's first arcade game, Vulgus, in North America. Of course, they became bitter arcade rivals with their vs. Fighting games. Interestingly enough, I think I saw this guy you interviewed on TV. I wish they would team up now and get some damn sega classics on wii u!!!! I love reading stories like this - I'm a sucker for anything retro! 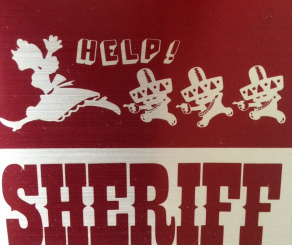 Isn't this just a Sheriff board mounted inside a modified Head-On cocktail cabinet? Wait... The cocktail cab is the white one shown in the pamphet, isn't it? I used to own one of those. I sold it a long time ago on ebay. The guy who picked it up said he was going to turn it into a mame machine. It twisted my stomach when he told me.